Ladies and gentlemen, I give you all...the Rush Rockband Resolution (or R3 as I like to call it for short ). I'll be making posts for all the tracks and albums as I release them. You may notice some "gaps" or missing tracks from each album. There's a very good reason for this: a number of other authors have already laid claim to a number of Rush songs and albums, so in order to respect their wishes (they all know who they are, so I'm not going to name names), I'll be saving those tracks for their rightful claimers. However, that still leaves all the remaining tracks from over the ages, and I have taken it upon myself to complete Rush's discography by charting the missing parts for each and every one (including pro keys ). Ever since I heard Rush was "retiring" (so to speak) I'm more motivated now than ever to do this project and to complete it by the end of 2018, which incidentally marks their 50th anniversary if you include their early days with John Rutsey and Jeff Jones . In fact, I now feel a sense of responsibility as a charter to immortalize Rush's discography as full band customs for generations to come . Sweet! Finally a thread about this! I so glad you're doing this and I'll gladly contribute whatever I can to this project. I know some of those older customs need fixes right down to the tempo map. If you need any help just let me know! Also you have the album section for "Anthem" listed as "Rush" when it should be "Fly By Night"
Great to see tracks from Grace Under Pressure get upgraded. Next to Permanent Waves and Moving Pictures, I'd say Grace Under Pressure is my next favorite album of theirs from the 80's. Great work, keep on going! Particularly waiting for You bet your life from Roll The Bones. I'm just somehow keen on that song. There is one thing however that was bugging me when playing your charts from Snakes and Arrows. The sound quality seems to be noticeably lower than on the disc, they just sound flat and lower clarity. 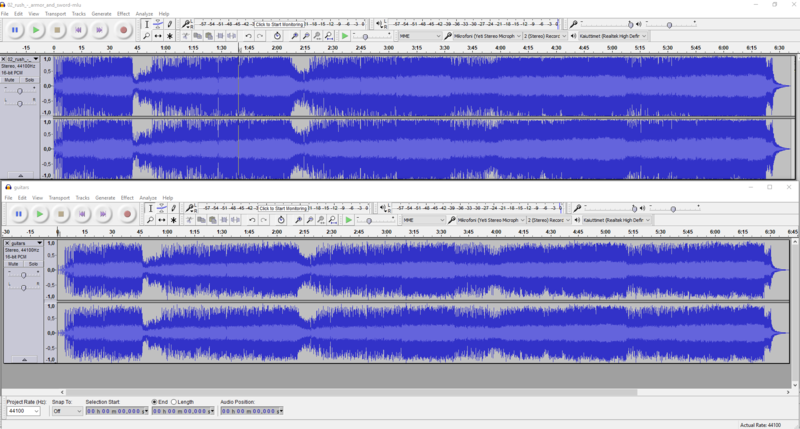 I did a audacity comparison and there is a clear difference between the disc and chart version(Rip from the disc is the upper one). This was most evident on the songs Armor and Sword, The Main Monkey Business and The Larger Bowl. Others sounded good enough for me ear even though they weren't identical to the disc rip I have. Maybe thats worth looking into? I ended up modifying the disc versions of the songs on audacity to replace the chart audio for now. Other than that no complaining, the charts themselves are very good.